﻿ Regular readers know I'm a big fan of the Miz. And not just a fair weather fan. I really like the guy. The character as well as Mike Mizanin. I met the Miz almost a year ago when he was doing the promotional stuff for a house show in Cape Girardeau, Missouri. Since then, he's won and lost the U.S. and picked up the tag team title with the Big Show. I'll admit back when he and Morrison split, I thought he'd be the "Marty Jannetty" of the team. 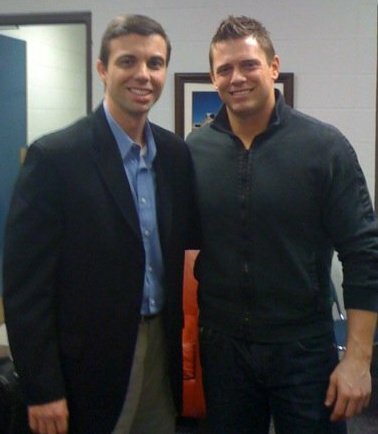 But the Miz worked hard to become a breakout. He made himself unique. He shed that persona he had with Morrison. That's something I think Morrison has just recently started to do and is finally enjoying some success now. The Miz winning the WWE title last night came as no surprise to me. And probably not to most fans. He's arguably been the fastest rising star of 2010. I was a bit surprised he cashed it in so soon. I thought the storyline might have extended into the new year. That being said, I really hope he has more success as a Money in the Bank winner/title winner than previous guys. Jack Swagger's reign was lackluster to say the least. And C.M. Punk was booked as a weak champion I thought. The Miz plays a great heel. But I think fans are starting to buy into his character. I hope they find a way to keep him as a "bad guy." I also think it would be great to see him enjoy a lengthy reign on top. It's time for some new blood, so I hope this stays the trend. I don't want to see John Cena come back in a month and win it. Or Triple H return from his injury and win. I want to see the Miz defending the WWE championship at Wrestlemania. Now that would be awesome!